This stencil allows you to quickly make floor markings that say, “Caution – Slippery When Wet.” If you are looking to help improve safety in your facility, this is a very simple and effective way to do it. You can easily apply paint on the stencil to put this message on just about any type of flooring you might have in your facility. Using stencils is an excellent way to send a message to the people in your facility. 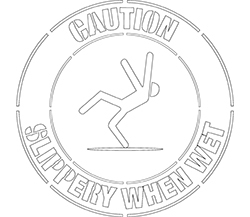 If you have an area in your facility that regularly becomes wet and can be slippery, this is a much better option than using a floor sign that you will have to put up and down. Having it written on the floor itself will remind people that they always need to be careful when walking through this area. Most facilities will use this stencil to mark off areas near entrances but if there are other areas that can become wet it can be used effectively there as well.